Out for Surround Sound Speakers? It can get immensely overwhelming with tons of options to choose from and when all of them happen to have their own unique features that stand out, you can only wish to pick all of them up and bring them home. Well, since that is not happening let’s make it a teensy bit easier for you to make your pick. These GPX surround sound speakers might be small in size and weigh 7.25 pounds but that has zero effect on its amazing capacity of diffusing sounds in all quarters. It comes with nice features, designs and specifications. 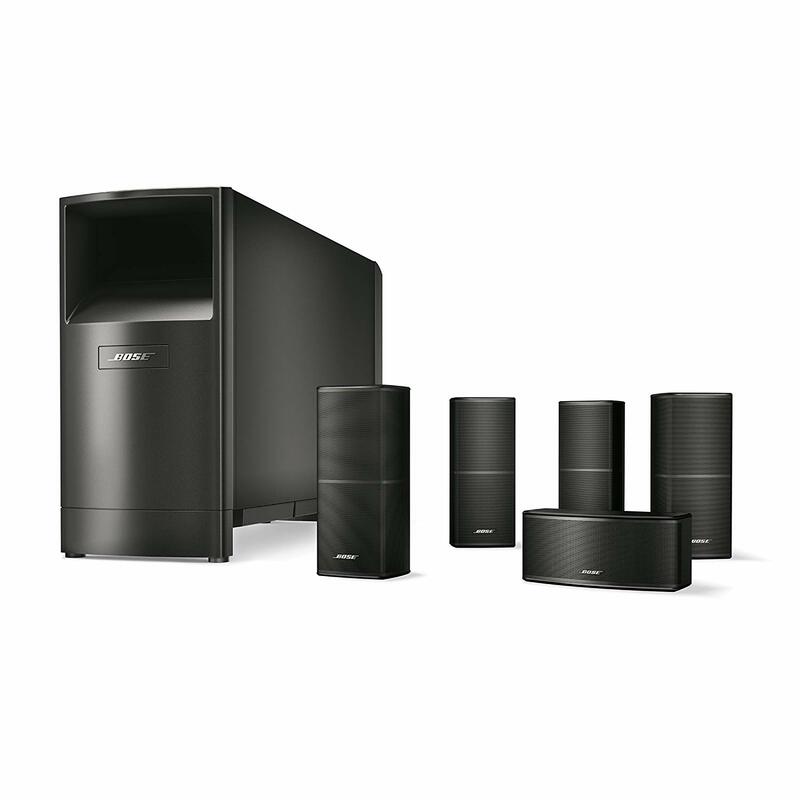 Equipped with a high power amplifier, front and rear speakers on both the left and right sides and Subwoofers- it will be contributing to your phenomenal home theatre experience without fail. This speaker has a virtual surround sound of 5.1 channel. It has RCA stereo audio inputs and also 3.5 audio inputs. There are built-in AC power cables and digital volume control for your usage. Reviews of this speaker are largely positive with the users being surprised since they were not expecting such good experiences from a speaker this small. If you’re on tight budget, this will be an appropriate speaker for you. However, it does not have a remote and has its controllers at the back of the subwoofers, which can be bothersome. 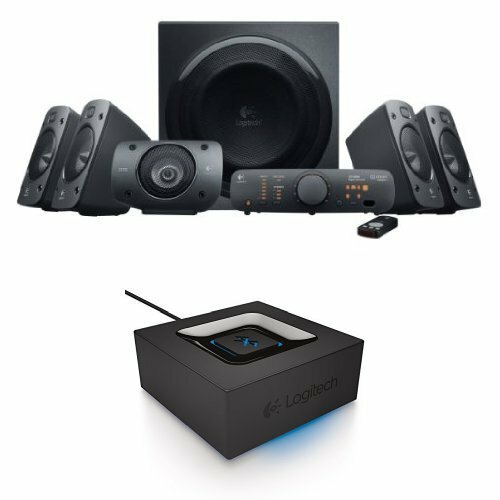 These gorgeous looking Acoustic Audio surround sound speakers which weigh 20 pounds have been talked about a lot regarding the high quality it provides for the money. It has a powered subwoofer along with 5 satellite speakers. What makes it all the more amazing is its RCA, 3.5 auxiliary interface being further equipped with Bluetooth specification which can connect ‘i’ devices, computers, laptops, digital media players, gaming systems, etc. The device has the power rating of 700 watts, power frequency response of 20 Hz to 20,000 Hz. It has an integrated audio amplifier, illuminated display, and also has bass, treble and main volume controls. Further included is a USB/SD card reader and it is also ported for fuller bass. Be careful with the volume adjustments when connecting during gaming or watching TV because the smaller speakers, the ones on the outside especially, require attention regarding the high-volume control. In order to experience one of the best surround sound speakers with amazing sound quality, connect this Z906 to your preferred device- be it your TV, Play Station, computer, etcetera. 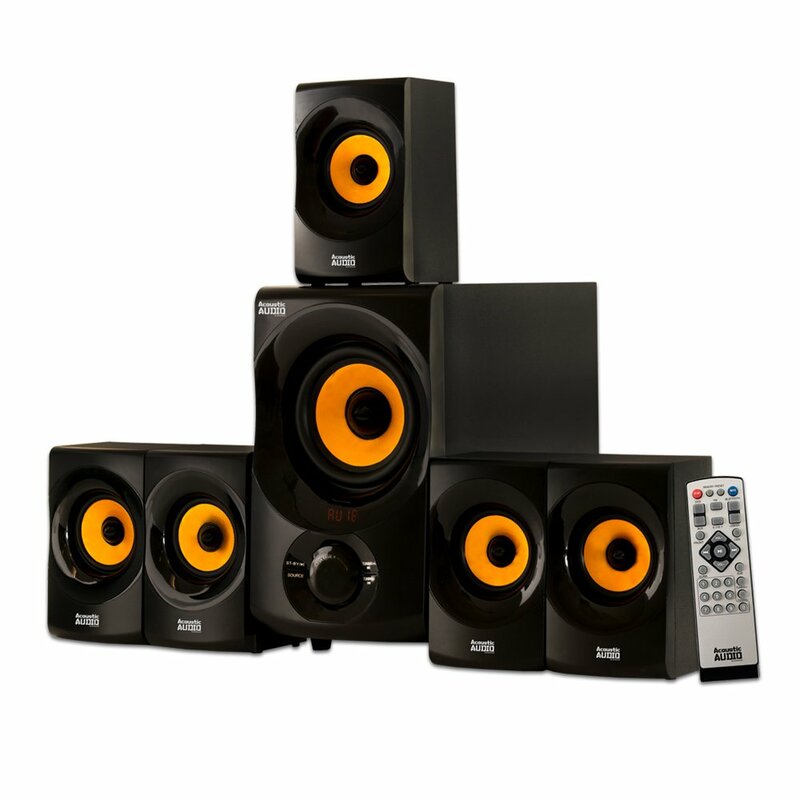 It has a Powerful THX-certified audio with studio quality of 5.1 surround sound which has an 8-inch driver. It also is an all-rounder when it comes to the setup. This system can be linked to up to six of your devices that are compatible via several different inputs, including digital coaxial inputs and optical inputs- you will have your control console and remote controls as well. It has a great controlling system. These speakers are perfect for the price, has powerful bass and high-quality sound. The speaker system is terrific. It was very hard to find a lot of users who were not happy with the product, however, these very users mentioned that the wiring is light and when the volume is lowered, the bass is flat. 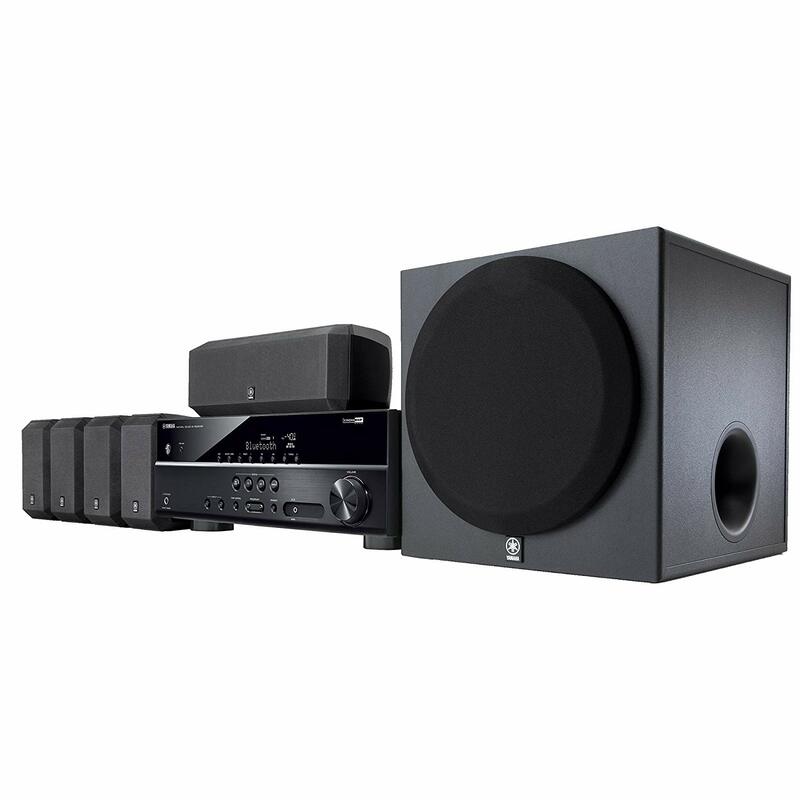 Polk Audio’s 14.25 pounds surround sound speakers that we have here is also small but mighty when it comes to audio quality- you will be left astonished. The price point is perfect and the specifications are amazing. It has a high-performance 5-piece surround system and has the center channel, tuned rear port, tweeters that are silk dome and technology that is inclusive of time lens. It also has drivers that are long throw, along with technology that includes dynamic balance driver and silk dome tweeters for loud and clear sounds. Whether you are new to creating home theatre or are adding extras to your existing one, it is a technological beauty to have in your home. 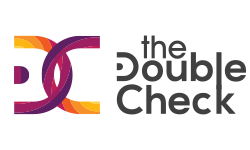 As mentioned previously, the price is fair and you will be sure to get exactly what you will be paying for. The customers seemed very content with this Polk Audio speaker. It is very easy to connect and once it’s done, its sound disperses all over the place. Users did not cease to use their creativity to try out all the possibilities with this speaker. Despite its size, it has continued to startle its users, more than once. Some users faced slight difficulties here and there but were able to solve the technical glitches and if not, they did get prompt refunds. 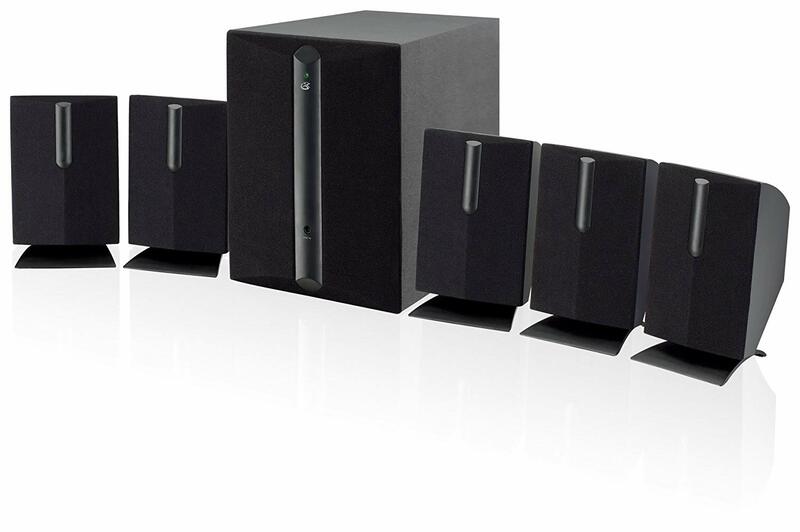 This chic looking black beauty is one hell of a good speaker if you want to change the game of your home theatre plan. The specifications are amazing: equipped with pass through that is ultra HD, HDR support, and functions including 3D- which means Blu-ray Disc, broadcast, and gaming is not to worry about anymore. 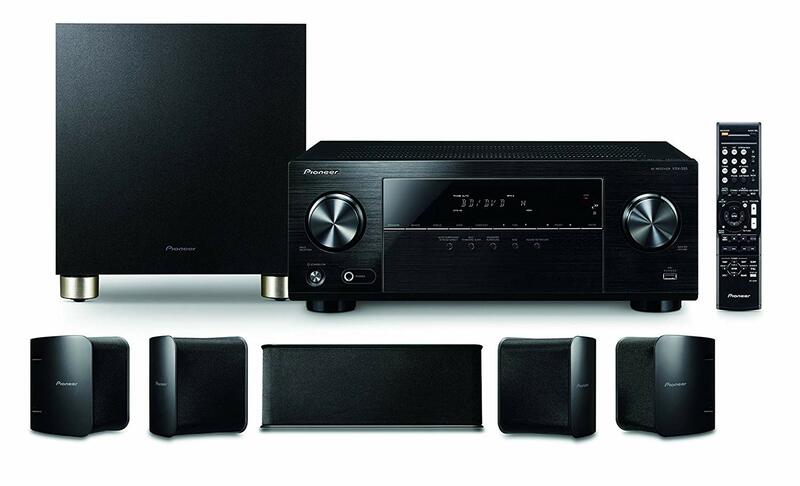 It has the 5.1 Channel AV Receiver with Bluetooth, and also AV Receiver. It has the built-in Bluetooth Wireless Technology with 5 compact speakers and a subwoofer. The price is perfect if compared to the standard and quality that this speaker provides. The reviews are significantly positive- the users have shared their dramatic experiences with this speaker with great excitement all over the internet. Users praised the entire system to bits for the amazing quality of sound for the price. However, it was also mentioned that it is not compatible with Xbox One S.
The 54 pound Yamaha Surround Sound Speakers are a terrific tech creation. The specification makes it worthy of its demand besides its mighty external features. This has Bluetooth enabling for vivid and loud wireless music playback. Its amplifier contributes to its beautiful diffusion of sound- it has a discrete 5.1-channel amplifier design. 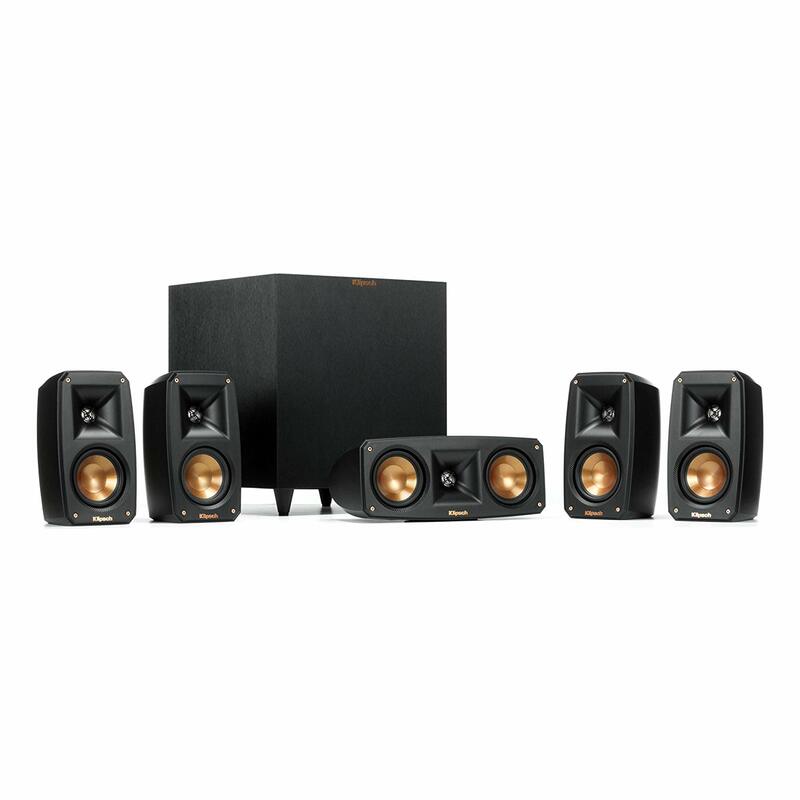 It is included with a compact 5.1-channel speaker system with a powerful 8 inch 100 watt powered subwoofer. It has a Virtual Cinema Front and extra bass. The users have spoken about their great experience with this speaker. Ever since this speaker has been around, it has received large appreciation for all the features, especially the HDTV picture. The bass is not like others, but richer and localized. The thrill of the sounds can be experienced for real, ideal if you are watching a movie, listening to a music, etc. If you are looking for a high-performance speaker, this Bose Speaker is definitely an ideal option. Be it sound quality, durability, ease of use, compatibility or design- this is a winner in all aspects, undoubtedly. 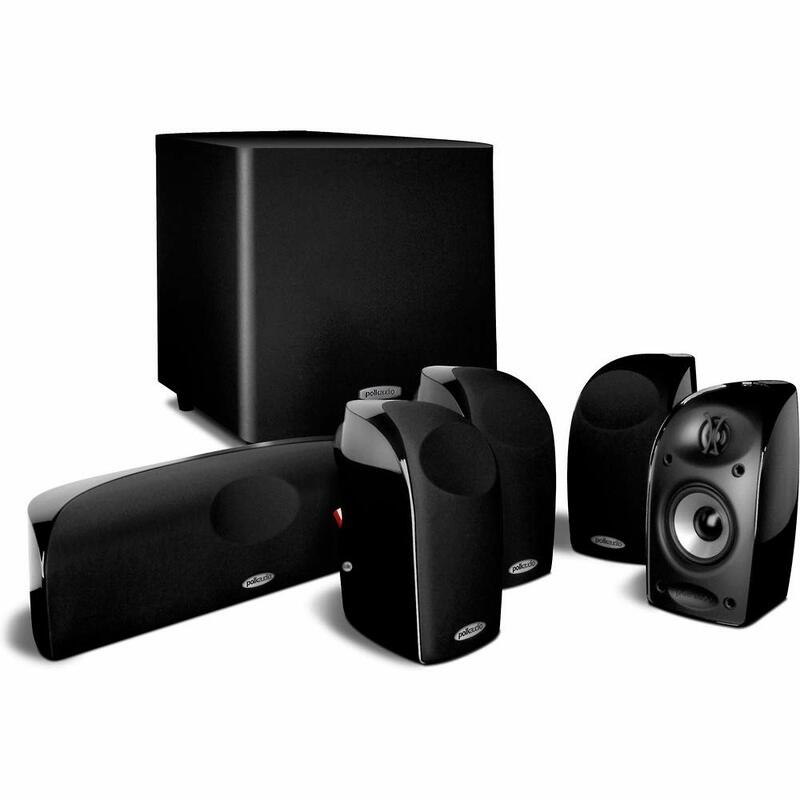 Right after you open the box, you will find 4 Direct Series II cube speakers, 1 center channel speaker (horizontal), Powered Acoustimass, 1 system input cable as long as 20 feet, 2 rear speaker cables which are 50 feet, 3 front speaker cables with a length of 20 feet, front center speaker’s rubber feel, and not to mention power cord. The external and internal when combined together and further compared with the price being asked for, this speaker will not have many competitors. Regardless of the space of the room this device is being used for, it is an amazing speaker. Its features are very striking- its body can be suspended on the wall and you can hand it around and below the TV for best performance. This noir beauty with the aluminum tweeters diffuses the cleanest and most natural sound you could possibly think of. It is designed to produce low frequency and room-filling sounds without the necessity of too much room. Klipsch has promised to provide us with a cinematic performance, wireless and robust bass, horn-loaded power, and flexible system placement. It weighs 32 pounds and is still small. This speaker left the users shocked and in love with this black tech artistry. Many claims that it is hands down one of the best speakers that there is on the market in 2019. It comes with all the surround speaker necessities: it has a wireless subwoofer. For maximum mounting flexibility, the satellite speakers have keyhole mount and threaded insert. This all-rounder of a speaker has great sound, received appreciation from all its users, who are surprised because of its performance being so great even though the size is so small. If you plan on going for the best, this might be it. You could have a big screen, Blu-ray, with everything looking lifelike but then, if you can’t hear it because of the tiny noise, does it really pay off? No, it doesn’t. Well, in order to fix that- surround sound speakers are here to save you. Small or big there are so many options to choose from. As I mentioned earlier, it can get absolutely devastating when you are out to choose the best fit for you. So many categories to choose from- have to look good, go easy on the pocket, and also provide phenomenal sound experience. Well, I hope the list helped you because I made sure to tick all these options off for you.